Few details but a report of shots fired and a man down and bleeding on Boylston near BroadwayRoy. CHS is heading to the scene. More soon. and now the helicopters. buzzards, I’m trying to. . . be lazy! 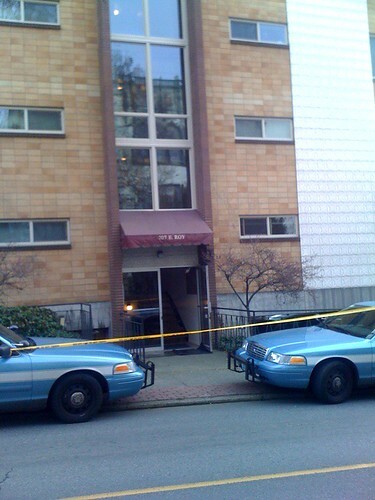 I just drove down E. Republican, 3 police cars, I was wondering what was going on, when I got into my apt. and heard the helicopters hovering, I knew it wasn’t going to be good. I hope the victim isn’t too bad off, and I hope they find the perpetrator soon. 3 blocks from home, scary. Police are saying that the wound was self-inflicted. How terribly sad. My thoughts go out to his family and loved ones. I wish there was a way for this man to have known that there were resources to have helped him. I heard the shot, went over to my office window, saw the body and called it in. Didn’t see or hear anybody else. Man, that was scary. That’s my apartment building in the photos. is that really where it happened? Sorry for the confusing first headline — Boylston near Broadway? It’s ALL near Broadway! I was rushing to scene. yeah, in the building in the bottom photo, I live in the building too. They’re not letting anyone onto the first floor. Watching the homicide detectives now. Looking more like a suicide. There’s a revolver. As always, thanks for the reporting and keeping us informed. Nice work Justin – thanks for covering. The large response was probably due to me calling it in as a shooting because that’s what it looked like from my vantage point seconds after I heard/saw it. At that time we thought there could be somebody nearby with a gun so I was thankful to see the police show up quickly and in numbers. An officer just stopped by to confirm it was indeed a suicide and there’s plenty of evidence to confirm it in his apartment. Scary and unfortunate – especially so close to home. I saw a young lady, brunette, who lives in there and visibly shaken. She wanted to get into the building and talk to her husband… I hope it wasn’t hers that did this. sad. 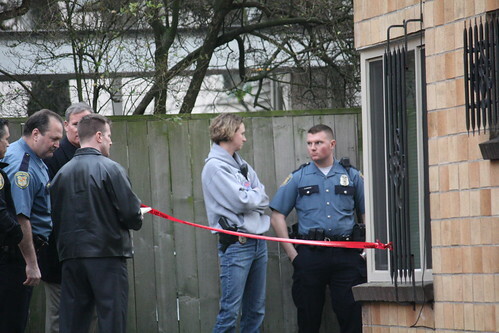 The man who shot himself behind the apartment building at 307 E. Roy (across the street from Cornish School (Kerry Hall), had a dog, and the animal control people were called to care for it until the next of kin were able to suggest responsibility for care of the animal. I spoke briefly with the animal control officer at about 4:10 pm. 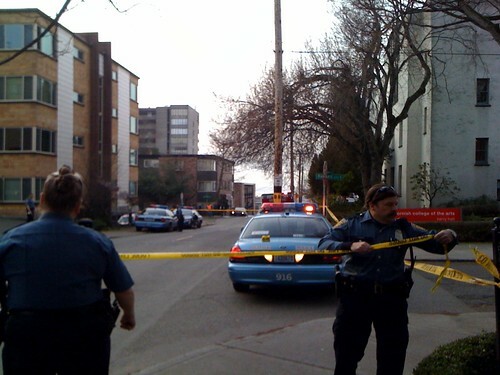 The person who died lived in the building and was polite enough to go outside to shoot himself. So sad. I suspect that part of the reason for the large police response is the location across the street from the school, which is both a college and a preparatory dance program for youngsters as young as 4. This is impressive, we have people who live in the building, guy who called the police who can see the scene form his window and other vivid misc.- other first hand information. Again, what is the name of the pet dog? Like a small town where everyone knows everything about anything. And, I did not mean to be flip. These moments break my heart. There is help for folks who feel pressed to the wall and then kill themselves. Very sad. I just found out that I knew this person. It really is more tragic than I thought. How sad. Yes, Prost and I have learned (unconfirmed) who it apparently was. Knowing about some things going on in his life makes this a deeply saddening end for a genuinely nice person. Maybe we can say more about it later. My heart hurts…. It’s weird, reading about the suicide death of one of your friends, even without enough details to form a meaningful story, and all the “police blotter”-like comments following it. It’s sobering to see death and life laid out like a tabloid. I wish peace to the family, and am still very heavy with the loss of [her].